Amy Herschleb attend Jim Dillon’s Hand Tool Sharpening class at Highland and came away with a new appreciation of working with sharp tools. In this series she will go into thoughtful detail on the 3 methods of sharpening Jim Dillon taught. Today she covers Method 1, Sandpaper on Glass. 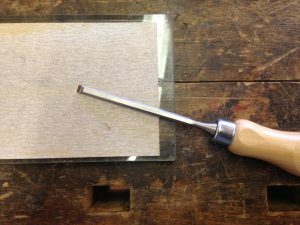 The first technique we learned was sandpaper on glass, the simplest and cheapest way to get started, though the most expensive method when used over time. The price of sandpaper eventually will exceed the short-term savings of a quick setup. We used wet-dry sandpaper (dry to minimize the mess in the workshop) beginning with 180 grit. The first directive was to flatten the back of the blade. By drawing the blade at an angle in a single direction, a diagonal hatching is achieved. When the entire back is thus marked, we move on to 220 and change the angle of the blade so that the scratch marks now make a cross-hatching. When the back of the blade is entirely changed to this opposing diagonal, we move up a grade of sandpaper, and so on until we reached 2400 grit. At 2400 we achieved a mirror-like surface, from which no further refinement was necessary. All that remained was to remove the burr left on the front of the blade by dragging the front of the edge, ever so lightly, against the sandpaper, then gently wiping the back on it. This technique, called “backing off”, prevents the edge from being crushed or otherwise deformed by being pushed against the burr, which is barely detectable. For the beveled edge we tried two different honing guides: a side clamp honing guide and the Veritas MK II standard honing guide. These guides support the blade at a consistent angle against the sharpening medium and require a simple measurement to set up (side clamp) or have predetermined settings (Veritas). Chris Schwarz recommends sharpening everything to 35° in his blog, Jim Dillon 30°, and both have made a wooden gauge set to their angle of choice. CLICK HERE to read Part 3 – Amy’s thoughts about the second of the three basic systems of sharpening she learned.